Special adaptor frames that allow Kirchhain type frames to be inserted into full sized bee hives so that the comb can be drawn or drawn comb can be filled with brood or stores, for later use in the Kirchhain nucs. These same frames can be utilised at the end of the season to place any remaining frames of brood or stores into full sized hives. This drawing shows the dimensions of a Kirchhain frame and the space that it occupies. I used a drawing similar to this to devise the layout of the large frames detailed below that will fit into a B.S. National hive to allow the smaller frames to be filled with stores or brood or the get foundation drawn. The drawings of the frames that can be used to adapt these small frames for use in full sized hives have been re-constructed using the same approach as was used to design the original ones that I made in the 1970s. The original drawings and the actual equipment were lost at the time of my bankruptcy in 1995. The method of construction is well remembered and owing to the limited possibilities of fitting the small frames within the larger format I am confident that the re-constructed diagrams are very close to the originals and that they are unlikely to deviate more than 1 mm or so from any samples that may eventually found. The quantities were not large... I had 11 plywood Kirchhain nucs (1 prototype and a batch of 10 production ones) I had 10 B.S. Deep adaptor frames that were built on the lines of the drawing further down this page. I had one oddball deep one that held two nuc frames and I had six B.S. Shallow adaptor frames as in the third frame drawing. This unusual looking device was my first attempt. It is made from standard B.S. deep frame parts and strips of wood 22 mm wide and 9 mm thick with 3 mm plywood cladding. The actual device was not as neat as the drawing may suggest, small pieces of thin aluminium sheet were tacked on to form small lips that retained the small frames in position. While this frame obviously worked, I was convinced that it was possible to fit four of the smaller frames into a B.S. Deep sized adaptor and so I used a drawing board to generate the design shown below. This empirical design achieves the fitting of four small frames within the standard B.S. brood frame, by cheating a little on the bee spaces below the individual frames and the stiffening strap along the bottom also encroaches into the bee space that exists below the adaptor frame. When I did this I was slightly worried that brace comb would be built, but this did not happen. In fact my recollections of burr and brace comb are that there was a little less excess comb than is evident on Peter Springall's frames that are depicted at the bottom of the page. The deep frame shown above also looks unusual owing to the material used to form the surface strapping. The green colour shown is a good representation of the actual material which was epoxy bonded woven fibre glass printed circuit substrate. (We used that in another part of the business.) This material is very strong and stiff and was of 1.6 mm thickness for all parts except the single central vertical strap that was of 2.3 mm thickness. M3 nuts and bolts or CSK woodscrews were used to hold all the items together and each fibre glass part was also glued using a rubber based industrial glue that was an experimental forerunner of our modern 'no nails' glue. If there is sufficient demand I will draw up and dimension the individual pieces that make up these adaptor frames. The plywood parts were intended to be 24 mm thick so that the combs would slide easily into the top of the frame, but when I measured two thicknesses of 12 mm ply they only formed an overall thickness a little over 23 mm, so I formed a sandwich of two pieces of 12 mm ply with some paper based electrical insulation material, all glued together with waterproof PVA glue. The final sandwich was a little over 24 mm. The deep frames had small rectangular pieces of aluminium added to form retaining lips so that the lugs would not fall off the ledges. These were merely scrap pieces left over from a punching operation in some aluminium sheet. Similarly the disc shaped pieces that were used on the shallow frames came from the scrap box under the press after some round holes had been punched. These special frames allow Kirchhain type frames to be inserted into full sized hives so that the comb can be drawn or drawn comb can be filled with brood or stores, for later use in the Kirchhain nucs. These same frames can be utilised at the end of the season to place any remaining frames of brood or stores into full sized hives. The photo above is of one of Peter's B.S. brood frames, the one below is a 14" x 12" type. 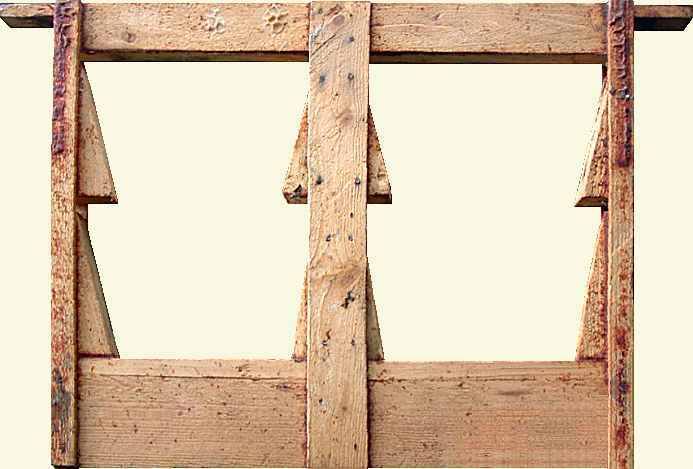 Note that the tips of the Kirchhain top bars are fitted into recesses cut in the side bars or holes formed by straps that hold the blocks in position. The device show at right can be used to fit a Kirchhain type frame in a half B.S. sized nuc, the ghosted frame is of the Wohlgemuth type. The small amount of relief above the centre portion of the top bar is to enable clustering of bees when Wohlgemuth introduction frames are used, but there is no reason why any Kirchhain type frame cannot be used in this adaptor. Rigidity where the frame lugs rest is provided by 16 swg aluminium strips that are folded for stiffness and let in to the woodwork. The drawing is at two pixels per mm and is to scale. The shaped pieces are built up from sheets of plywood then cut on a bandsaw. The labyrinth slots that form the bottom portion allow free passage of bees, but there is no place for brace comb to be built as the gaps are nominally 8 or 9 mm and are 'bee space' the wooden laths are also nominally 8 or 9 mm, with the bottom most one being sized to suit the remaining space after the others have been fitted.